Derek Barnard born in Gillingham in 1944 and educated at Gillingham Technical High School, St Luke’s College Exeter and University of London. Holds degrees in Education and Geography. Retired from 41 years of teaching in 2006 having been Headmaster of Tunbridge Wells Grammar School for Boys from 1988 to 2006. Played his first game of men’s cricket at the age of ten( no helmets then) and has continued to play since. As he lives in Sussex he has to play Over 60’s and Over 70’s cricket for Sussex. Has been Chairman of the East Sussex Cricket League since 1996 and was Chairman of The Cricket Society from 2008 to 2012. 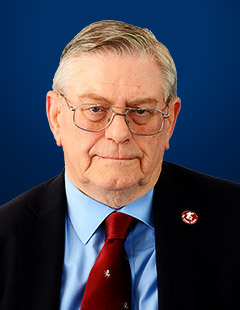 He has served as Vice-Chairman of Kent County Cricket Supporters Club since 2008. Derek saw his first Kent game at Canterbury in 1955 when the County entertained South Africa. Has written two books on cricket and is an avid collector of cricket books, especially Wisden. Has supported Gillingham Football Club through the highs and lows since 1952. Married to Sheila and they have three grown up children and six grandchildren.